I am Professor of Media and Communication with Focus on Innovative Methods at ZeMKI, Centre for Media, Communication and Information Science, University of Bremen. I have previous held positions as Assistant Professor at the Department of Media Studies and Journalism, University of Groningnen (Aug 2017-March 2018), Research Fellow at the Mannheim Centre for European Social Research (MZES) (2013-2017). From 2011 to 2013 I was also Alexander von Humboldt postdoctoral fellow at the MZES, University of Mannheim. My research and teaching interests are in the areas of digital media and political participation, political communication, computational social science and social network analysis. My current work focuses on (but is not limited to) two interconnected topics: participatory inequality and the normalisation of incivility in online spaces. The first stream of my research focuses on the investiation of the longitudinal impact of social media use on political participation — and democracy more broadly — using panel data and experimental methods. The second stream of my research utilises social media data and investigates uncivil interactions between citizens and politicians on social media. I am particularly interested in understading the broader and potentially corrosive consequences these developments have on democracy — especially on the possible demobilising impact on both citizens and politicians. My new book investigates conceptual and empirical topics in the study of political participation, with emphasis on how digital media have affected political participation. It is now available on Kindle, as well as in Hardcover version and can be purchased on Amazon. You can also have a look at some of the content at Google Books. 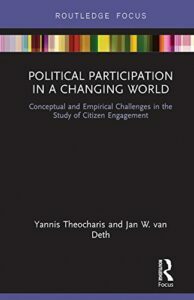 Read information about Political Participation in a Changing World: Conceptual and Empirical Challenges in the Study of Citizen Engagement here.